London VAPC commissioned study by legal experts at the University of Kent. Left to right, Jim Blake, London VAPC vice-chairman and an Army Veteran; Lynn Verity, chairman of London VAPC; report authors Professor Helen Carr and Dr Edward Kirton-Darling from Kent Law School, University of Kent. Photo: Paul Clabburn. All rights reserved. All of London’s local authorities could do more to help homeless ex-servicemen and women, an independent study published on Wednesday, December 21, has found. In assessing the capital’s local authority provision for homeless former members of the armed services, the report’s authors found that only 9 out of 33 made an explicit online acknowledgement of their duty towards veterans and that there were ways all 33 could improve. The study also found examples of allocations policies which did not comply with the law, which provides for particular duties towards veterans and their families. Professor Carr and Dr Kirton-Darling, who said that clarity was needed on the test for vulnerability as it affects veterans, presented examples of good and poor provision across London and made recommendations on how to address the situation. 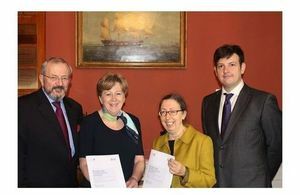 The University of Kent have produced extremely valuable independent academic research which shows much more could be done to help ex-servicemen and women who are homeless. This is not about how many of our veterans are on London’s streets nor why they find themselves there. Rather, it is about ensuring that any homeless veteran who goes to a local authority for help is treated fairly. This report suggests that, too often, they are not. We are very grateful to the University of Kent for accepting our commission to carry out this research. It will help to inform the debate in an important area of housing policy and we look forward to working with both the university and local authorities to address the issues raised by the study.